Q1:Â WhatÂ isÂ yourÂ MOQ? OurÂ MOQÂ isÂ normallyÂ 80pcs,Â whichÂ isÂ adjustableÂ inÂ specialÂ case. Q2:Â CanÂ IÂ getÂ aÂ sampleÂ beforeÂ formalÂ order? Yes,weÂ areÂ honoredÂ toÂ offerÂ youÂ theÂ sampleÂ forÂ qualityÂ checkÂ orÂ OtherÂ businessÂ purposes,butÂ weÂ kindlyÂ askÂ youÂ toÂ payÂ forÂ samplesÂ andÂ theÂ freight. Q3:Â WhatÂ isÂ yourÂ capabilityÂ ofÂ productionÂ andÂ theÂ leadÂ time? 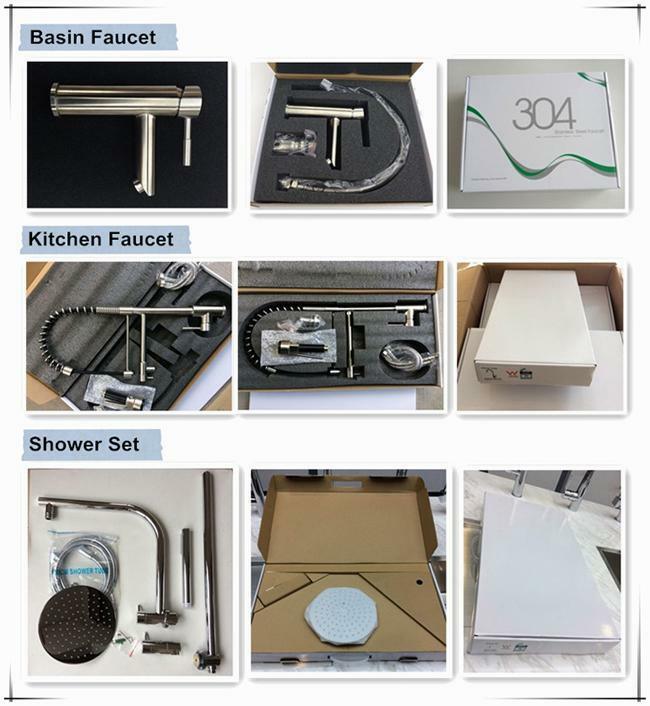 NormallyÂ weÂ canÂ manufactureÂ 5000pcsÂ faucetsÂ orÂ 3000pcsÂ showerÂ setsÂ perÂ month. TheÂ leadÂ timeÂ forÂ theÂ stockedÂ itemsÂ isÂ 3-5Â days;Â IfÂ noÂ stock,Â usuallyÂ itÂ isÂ 7-15Â daysÂ forÂ smallÂ order,Â andÂ 15-45Â daysÂ forÂ bigÂ order. Q4:Â HowÂ aboutÂ yourÂ Â qualityÂ control? AllÂ productsÂ haveÂ toÂ passÂ strictÂ inspectionÂ beforeÂ theyÂ goÂ outÂ ofÂ ourÂ factory,Â ifÂ youÂ need,Â youÂ canÂ arrangeÂ aÂ qualityÂ inspectionÂ beforeÂ theÂ shipment. Q5:CanÂ IÂ visitÂ yourÂ showroom/factory? Yes,ourÂ factoryÂ isÂ inÂ KaiPing.AlsoÂ weÂ haveÂ theÂ showroomÂ inÂ Guangzhou,whichÂ displaysÂ aÂ fullÂ setÂ ofÂ latestÂ seriesÂ itemsÂ andÂ onlyÂ takesÂ 1Â hourÂ fromÂ airport. Q6:WhatÂ certificatesÂ doÂ youÂ have? 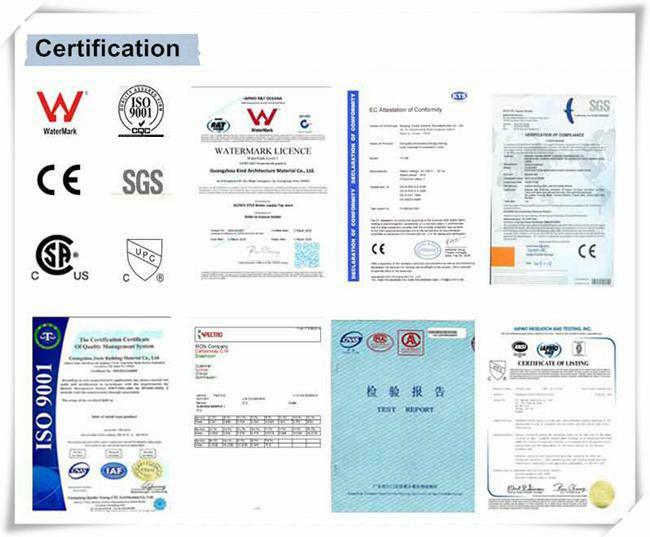 AlmostÂ allÂ ofÂ ourÂ productsÂ areÂ withÂ WATERMARKÂ certificate.Â ForÂ someÂ models,Â theÂ certificatesÂ areÂ alreadyÂ available.Â ForÂ otherÂ models,Â weÂ willÂ needÂ yourÂ assistanceÂ toÂ applyÂ theÂ certificates. Q7:Â Â HowÂ longÂ theÂ warrantyÂ youÂ canÂ offer? WeÂ canÂ provideÂ 7Â yearsÂ warrantyÂ forÂ ourÂ products.Â WeÂ haveÂ aÂ documentÂ specifiedÂ warrantyÂ clauses,Â pleaseÂ feelÂ freeÂ toÂ sendÂ inquiryÂ forÂ moreÂ details. Q8:Â CanÂ weÂ printÂ ourÂ logoÂ onÂ theÂ productÂ orÂ produceÂ theÂ customizedÂ itemsÂ accordingÂ toÂ ourÂ drawings? 1.WeÂ areÂ theÂ professionalÂ sanitaryÂ wareÂ factoryÂ hasÂ 14Â yearsÂ experiencedÂ andÂ purchasingÂ recommendationÂ forÂ customers. 2.TheÂ warrantyÂ isÂ 7Â yearsÂ andÂ perfectÂ after-saleÂ serviceÂ system. 3.WatersinoÂ hasÂ strictÂ qualityÂ control.Â TheÂ faultyÂ products,Â ifÂ found,Â willÂ beÂ sentÂ backÂ toÂ remadeÂ immediately. 4.WeÂ hasÂ suppliedÂ numerousÂ projectsÂ thatÂ coverÂ overÂ 100Â cities,hasÂ suppliedÂ numerousÂ projects. 5.ComponentsÂ WatersinoÂ usingÂ forÂ theÂ faucetsÂ areÂ underÂ topÂ levelÂ worldwide. âˆšÂ No.1Â cartridgeÂ brandÂ inÂ theÂ worldÂ --Â KeroxÂ &Sedal. âˆšÂ No.1Â waterÂ savingÂ aeratorÂ --Â Neoperl. âˆšÂ No.1Â HouseholdÂ nameÂ flexibleÂ hosesÂ --Â Tucai. âˆšÂ LeadÂ freeÂ brassÂ materialÂ comesÂ fromÂ theÂ topÂ brandÂ factoryÂ namedÂ Weiqiang. âˆšÂ StainlessÂ steelÂ materialÂ comesÂ fromÂ theÂ topÂ levelÂ companyÂ inÂ Korea,Â PohangÂ isÂ underÂ theÂ AISIÂ Â Â Â Â standard. 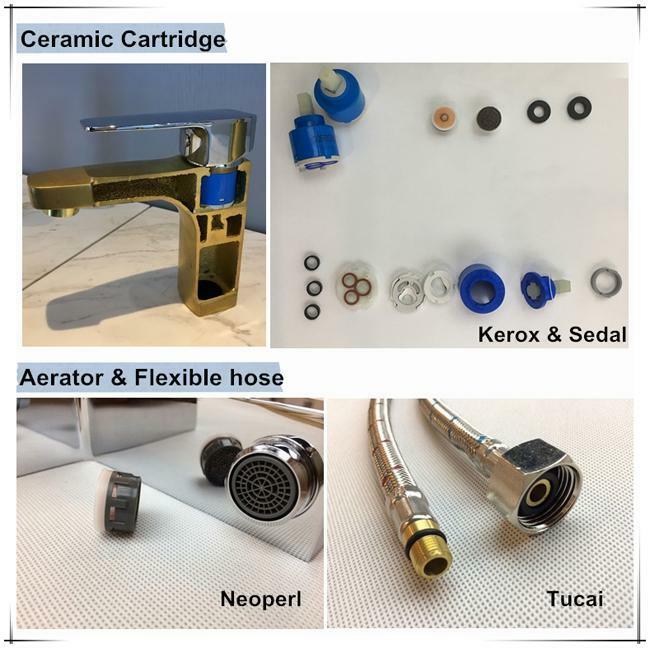 TheÂ aeratorÂ isÂ formÂ Neoperl,Â theÂ bestÂ aeratorÂ brandÂ inÂ theÂ world.Â AndÂ theÂ flexibleÂ hoseÂ isÂ fromÂ Tucai,Â theÂ topÂ waterÂ inletÂ hoseÂ brandÂ inÂ theÂ world.Â AllÂ accessoriesÂ areÂ underÂ topÂ level. TheÂ goodÂ qualityÂ surfaceÂ finishÂ makeÂ theÂ productsÂ lookÂ amazing.Â WeÂ useÂ theÂ advancedÂ electroplatingÂ technologyÂ toÂ makeÂ sureÂ theÂ productsÂ corrosionÂ resisting,Â durableÂ andÂ stunning.Â AÂ lotÂ ofÂ differentÂ kindsÂ ofÂ finishesÂ canÂ beÂ manufacturedÂ byÂ ourÂ factory,Â andÂ theÂ customizedÂ finishÂ canÂ beÂ manufactured,Â moreÂ optionsÂ forÂ yourÂ modernÂ bathroomÂ orÂ project. Good package can protect the products during the shipment, and make the product look noble and high-end. Our products had been exported many countries and areas in the world, such as Australia, United State, Europe, Asia and so on. We have many certifications for different countries. Â Please feel free to contact us or visit us if you have any question or need more details! Â Â Â Â Â Â Thank you!